DSP Trigger, Audio/MIDI Converter Software from AudioFront. AudioFront has updated DSP Trigger to version 1.2.0.4. This version includes a new auto-routing feature so that it's no longer necessary to set-up multiple MIDI tracks when using multiple instances of DSP Trigger. All the MIDI is routed to the instance whose 'MASTER' LED is lit. Added an advanced control to the rimshot display area. Right-click to access it. New control called 'SteadyShot' which aims to use heuristics to improve positional sensing during rolls. Right-click on the display area of the positional BIAS to reveal the new control. New pad type for Roland Mesh Pads designed to improve positional sensing. Fixed a bug that prevented soft hits from registering until you hit the pad pretty hard. Fixed an issue in the MAC version that prevented loading the 'save as default' settings. Fixed an issue with new instances sometimes stealing the 'master' status. More sensible calibration defaults for 'Microphone' mode. Fixed an issue with Microphone mode and crosstalk cancellation. Fixed an issue with calibrating the scan time. The transient profile of hits that are canceled by the crosstalk cancellation are no longer displayed. Fixed a crash when trying to load the manual (PC Version). 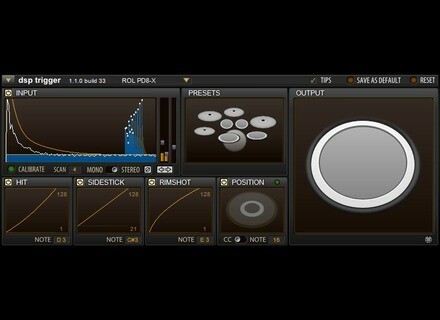 DSP Trigger for Windows (VST) is available for $39 USD. For more information, check out AudioFront and DSP Trigger. Konkreet Performer Updated Konkreet Labs has updated Konkreet Performer, a music control and performance instrument that was designed to "use multi-touch technology to the full." TX16Wx Free Multitimbral VSTi Software Sampler TX16Wx is a free VSTi Sampler with a fully documented file format. Sound Magic Exciter Sound Magic Exciter is described as a full range exciter designed to add harmony to your music.